Android 5.1 OS with nabi Blue Morpho overlay. It supports 802.11a/b/g/n Wi-Fi and Bluetooth 4.0 wireless connectivity as well. These buttons function perfectly with the bumper on or off. nabi Elev-8 8" 32GB Kids Tablet (White). Be Anything With Barbie! PHONES AND LTE TABLETS DO NOT INCLUDE SIM CARDS. Kids can draw, animate, write a storybook, and edit their own created movies. It features a large 8" touchscreen with a resolution of 1920 x 1200 pixels. This tablet has a 16GB built-in storage that can be expanded up to 32GB via a microSD card. THE FIRST TABLET FOR THE NEXT GENERATION OF CREATIVE HEROES Let's create with Dream Pro Studio, a powerful suite of creative tools that teach your children how to draw, animate, author their own books and edit movies like a pro! Be Anything With Barbie™! 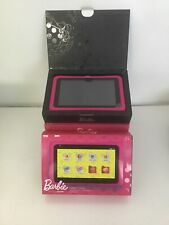 The Barbie™ Tablet is a full-featured Android™ tablet with a 7" high-resolution 1024x600 capacitive multi-touch screen, fast and powerful quad-core processor and an internal storage of 16GB (Expandable to 32GB via MicroSD). Nabi Hot Wheels Kids Tablet With Orange Bumper 16 GB 7"
The ultimate Hot Wheels experience for fans and thrill-seekers! PHONES AND LTE TABLETS DO NOT INCLUDE SIM CARDS. Bumper Color may vary between red and orange The unit has been tested all functions are working as intended. See Photos for detail. This device has a 3.5mm standard audio jack, a built-in microphone, integrated speakers, and four nabi connectors. For audio and video playback, the MP3, AAC, MPEG-4, H.263, and H.264 formats are supported. "Kids Learning Tablet Nabi Nick Jr. Edition 8GB Android Wi-Fi NABIJR-NV5B. Model: Nabi Jr. Product Line: Nabi. Edition: Nick Jr. Type: Learning Tablet. Touch Screen Technology: Multi-Touch. Rare Deal. With an engaging introduction to letters, phonics, numbers, colors and shapes plus dozens of videos featuring beloved Fisher-Price friends, this educational tablet is the ultimate learning tool. It has a fast quad-core processor, internal storage of 16GB (Expandable to 32GB via MicroSD) and runs on Android 6.0 Marshmallow for a seamless tablet experience. Nabi Elev-8 8" 32 GB Kids Tablet FCN95 Black/Red - New In Box. Condition is New. Shipped with USPS Priority Mail. This item is used. Physically looks to be in good condition. Has a star wars sticker decal on the tablet. Any other functionality of the tablet has not been tested. because its only partially tested, its being sold for parts or repair. Enjoy movies and read e-books on the 1024x600 resolution screen. Series NABI. Color Black, Red. Other Technical Details. Rear Webcam Resolution 3 MP. Graphics Coprocessor NVIDIA. Hard Drive 8 GB Emmc. With an engaging introduction to letters, phonics, numbers, colors and shapes plus dozens of videos featuring beloved Fisher-Price friends, this educational tablet is the ultimate learning tool! Nabi 2S is the fastest, most powerful tablet in the world made just for kids to Learn, Play and Grow. GREAT FOR TEACHING GOOD CHOICES Your kid can earn nabi CoinsTM when they complete lessons in Wings or finish chores in Chore ListTM. ¡ S í, H a b l o E s p a ñ o l ! NABI PLAY™ AND NABI WEB™. Let’s explore with nabi OS 3.0, "Blue Morpho," which starts with Android Kit Kat and adds over 400 kid-focused, parent-approved features. TREASURE BOX™ AND NABI COINS™. Let’s write and draw with the only kids’ tablet that includes a high precision digital stylus that writes just like a pen. Model: NBX208H00004US. nabi Elev-8 features Wings Learning System for skill set mastery in math, reading and writing. Nabi Elev-8 8" Screen 32GB Kids Tablet Red (Certified Refurbished). This nabi Elev-8 8" 32GB Kids Tablet is in great working condition. Up for sale is a Nabi 7" Kids WiFi Android Tablet Red NABI2NV7A NABI2-NV7A. This tablet is fully functional and ready for use. The following 17 point check has been completed on this Android tablet. Fuhu Nabi 2 Children's Interactive Tablet. I really hope you like it! (included). Hard Drive Rotational Speed1 RPM. Hard Drive InterfaceATA133. Processor Count4. Rear Webcam Resolution3 MP. NABI ELEV-8 TABLET, BRAND NEW, 32GB, WIFI, KID FRIENDLY, ANDROID, GOOGLE PLAY . Condition is New. This is new, 100% guaranteed authentic (not fake/not imitation). Domestic only, no international shipping! Quality Nabi DreamTab HD8 Creative Kids Tablet. Let's explore with nabi OS 3.0, Blue Morpho, which starts with Android and adds over 400 kid-focused, parent-approved features. Blue Morpho OS was built from the ground up to help give parents peace of mind with a tablet made just for their kids. Excellent condition. Includes everything that is in the photos. Manufacturer: NABI. NABI 2 with WiFi 7' Touchscreen Kids Tablet PC Featuring Android 4.0 (Ice Cream Sandwich). Tablet PC With WiFi Technical Specifications Built-in 802.11ba//g/n WiFi and Bluetooth v3.0. Nabi Hot Wheels Kids Tablet White great condition. SHOWS LIGHT SIGNS OF USE. ITEM WORKS PERFECTLY. Bumper is not included, adapter is in a box. It would be very much appreciated. Nabi DreamTab HD8 is the first tablet for the next generation of creative heroes. "THE FIRST TABLET FOR THE NEXT GENERATION OF CREATIVE HEROES Let's create with Dream Pro Studio, a powerful suite of creative tools that teach your children how to draw, animate, author their own books and edit movies like a pro! Nabi Jr. is the ultimate full-featured learning tablet built just for kids to learn, discover, and grow. Like your tablet, it was designed as a tool, not as a toy. nabi Jr. is the first tablet certified by Trustee as COPPA compliant. Item has been tested and is in working order. New nabi Jr. 8GB Kids Android Learning Tablet #3227 (YM). Nabi Jr., the first full-featured learning tablet built for kids to Learn, Discover, and Grow, has partnered with nick Jr. on this special edition tablet. Kids can play, read and watch with their favorite nick Jr. characters such as: Dora the Explorer, Team Umizoomi, Bubble Guppies, and more. Unless otherwise stated, this has been tested for key functionality. This has been tested and it is in good working order. Item is in good physical condition as pictured. The screen is cracked, see the pictures for more information. A real Android tablet. Designed for real kids. We embrace, encourage and nurture it. nabi Coins and Treasure Box. Rewarding kids for making good choices. Finishing chores and completing lessons may not be your child's highest priority. This item pre-owned and is in good condition with scuffs and scratches with no stylus. The unit has been tested all functions are working as intended. See Photos for detail. The nabi Jr. 8GB Tablet is the ultimate full-featured tablet for kids to learn, discover and grow. Zagg Cleaning Foam Included.